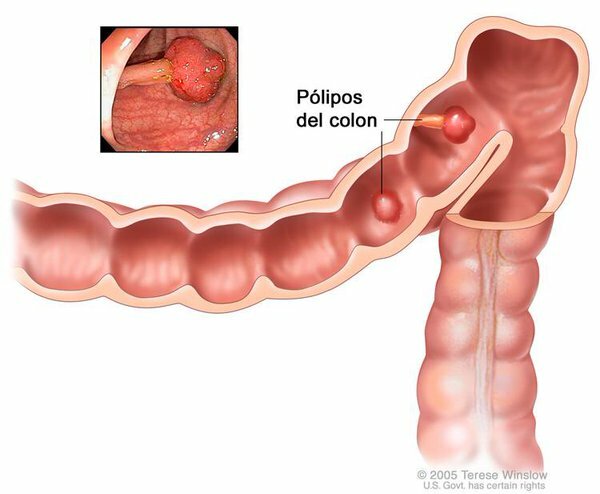 Colon polyps are benign growths that are formed in the interior of the colon and most are harmless in nature, but some of them eventually may take the form of malignant forms - cancer of the colon. Therefore, it is very important to detect them in, monitor and cure them. In this article find out what causes them, what are symptoms of the disease, what diet to use and how to treat them with the help of herbs? Polyps in the intestines are very widespread in developed countries, it is considered that every third person over the age of 70 has them. There are many potential causes of these problems, and some of them are heritage, inflammatory bowel diseases such as Crohn's disease and ulcerative colitis, obesity, chronic constipation (constipation), lack of physical activity, smoking, excessive use of alcohol and improper diet (lack of fibre and too much fat and processed food). In addition, the risk of polyps significantly increases over the years. Polyps of the colon can certainly be avoided, or the chances of their formation can be very small, if you eat healthy and regulate your diet, engage in recreational sports, and from time to go on a check-up. The right diet and increasing fluid intake during the day is the key to all our ailments, especially for bowel disease, so pay to these things. According to statistics, almost every other person in the course of life has problems with large intestine and the main culprits are polyps. The colon is the final part of the digestive tract and continues to the small intestine where it accepts the content of which absorb water and salt. It is inhabited by countless bacteria whose job is to synthesize vitamins that the body then absorbs. Since it is one of the main organs responsible for detoxification, properly functioning of colon is essential for our overall health. Harmful substances such as various bacteria, food additives, pesticides, environmental pollutants, chemicals and drugs are filtered out by an internal detoxification process and eliminated through our intestines. However, due to excessive exposure to toxins in the body through the air, food and water, and insufficient intake of adequate fiber foods and excessive consumption of alcohol and caffeine leads to disturbances in the colon and various ailments. Also, the culprit may be stress, lack of exercise and excessive use of antibiotics and drugs. When the detoxification process is disturbed, toxins circulate in the blood instead of being eliminated through the colon, causing a number of serious health problems, such as constipation and chronic, ulcerative colitis, colon polyps and cancer. What are the symptoms of colon polyps? Polyps of intestine usually cause no symptoms especially in its early stages and that is if they are small in size. For this reason, we advise the routine check-ups after the age of 45. However, in some cases, symptoms of colon polyps can occur in the form of constipation, frequent diarrhoea rectal bleeding, severe abdominal pain, vomiting, nausea and loss of body weight. So if you notice some of these signs, pay attention, especially on the appearance of the stool and, if necessary, go to the doctor. Bleeding from the colon cannot be overlooked, although it is often associated with haemorrhoids that are almost the most common problems of modern man because of prolonged sitting and unhealthy way of life. If you suspect on haemorrhoids, a doctor usually in addition to regular review will propose colonoscopy. However it is not sufficient to diagnose polyps in the colon based on the analysis of 20-25 cm part of the colon, so colonoscopy is necessary because it gives insight into the complete situation. People are generally afraid of colonoscopy, considered that it is extremely painful. We can say that this information is far-fetched. Colonoscopy of colon is more uncomfortable and unpleasant, but painful bowel examination is not some of them. If your doctor has recommended it, you should make proper preparation for colonoscopy, the exact schedule and hour requires cleansing of intestines. Conquer your fear, because it will do a lot for your health. If gastroenterology expert notices polyps during colonoscopy, he easily pulls it out with colonoscopy. In case that the polyps in the colon are larger in size surgery is necessary. In case the doctor does not notice them that is good for you because the procedure is then completely painless. Regardless of the type of problem, whether it be colon polyps, haemorrhoids, or cancer, the first doctor’s advice is proper nutrition. First of all, you should reduce the intake of fats, foods of animal origin, products from white flour and sugar, alcohol, food industry and those exposed to long-term heat treatments. On the other hand, recommended is intake of large quantities of vegetables and fruits that are rich in fiber, like whole grains, legumes, seeds and fruits. It is advisable to use cold pressed olive oil, and moderate amounts of lean meat and fish. According to valuable substances leading is cabbage, broccoli, Brussels sprouts, and cauliflower: consuming brassicas only once every two weeks reduces the risk of malignant tumours. Fibres of apples, pears, bananas, prunes, apricots, carrots, beans and white membrane on citrus fruits, are known as pectins, and their preventive effect prevents the development of diseases such as colon polyps and cancer, these claims are scientifically proven. Regular consumption of flaxseed helps bowel movements, but in the long run it reduces the risk of polyps and cancers. It is important to note that they can exert a beneficial effect only if you consume ground flax. Therefore for a daily meal eat a tablespoon of flax seed and do not forget to consume fluids during the day (at least eight glasses of water). Mix two tablespoons of St. John's wort and milfoil leaf and flowers and a tablespoon of lemon balm leaf, plantain leaf, mint, sage and nettle leaf, and pour everything with 1.2 litres of boiling water and leave it covered to rest for 90 min. Strain and drink a cup of tea before and after all the main meals of the day. Polyps in the colon can be treated with the help of the local tea mixture: mix two tablespoons of finely chopped marshmallow flowers, pine needles and one tablespoon of flower and leaf of St. John's wort, the leaf of yarrow, nettle leaf, mint leaf and sage, and pour with 1.6 litres of boiling water and leave well covered to stand for an hour and a half. Strain and drink during the day. Mix 4 tablespoons of the rhizomes and one tablespoon of St. John's wort, milfoil, common centaury, nettle, and cover with 1.6 litres of boiling water and leave to stand covered for 90 minutes. Strain and drink during the day instead of water. We hope that you found out how to treat polyps in the colon.